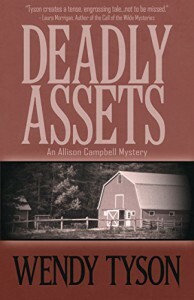 Allison Campbell, image consultant, and all her friends are back and they have an intriguing mystery on their hands. Two clients of First Impressions image consulting have disappeared on the same trip with Vaughn, Allison's business manager. While there doesn't seem to be any way it could be related to Allison and her business, it did happen on their watch and it will cause trouble for Vaughn if they aren't found. One is a 60 year old Italian wine heiress and the other, an 18 year old rising pop star with seemingly nothing in common. Allison, Vaughn and Mia, Allison's ex mother-in-law get begin trying to find these two women and the path just gets more murky and dangerous as they go. There are dark family secrets, mob connections, mysterious private detectives and connections back to Italy. I was sure I knew what was going on several different times but then was proven wrong. It's not an over-difficult mystery but it does have twists and turns along the way. I enjoyed the plot and the characters very much. The relationships between the main group of characters is one of the biggest strengths of this series so far. I really can feel the bonds between them. This is one of those books I looked forward to getting back to every time I had to set it down. My only reason for not giving it the full five stars is that you do have to suspend disbelief a number of times. As with most stories about amateur sleuths, I never can figure out why people answer their questions. I wouldn't. If a random person shows up at my door telling me they are investigating a disappearance, I'm not letting them in my house. I'm shutting the door and calling the police. It's also hard to image a professional at the level Allison is shown to be could just take off from her business from days at a time to investigate these disappearances, much less be willing to spend all the money she spent on rental cars, hotels and new clothes. All that said, I still loved the story. Interesting mystery, strong women, good inter-personal dynamics, just suspend your disbelief and enjoy the story. I've already started on the third one. This book was provided by Netgalley for review but my reviews always reflect my true feelings.